In 2012, the Supreme Court preempted state contract law to make way for binding arbitration agreements in contracts of adhesion vis-à-vis consumers, on the basis of a 1925 statute. That led to an immediate, predictable, and unfortunate wave of amendments to terms & conditions by websites and businesses — including by Microsoft. Many of those terms were in take-it-or-leave-it clickwrap agreements, and the amendments themselves were practically imposed: in many cases, a consumer could only reject the binding arbitration provision by discontinuing use of the website or terminating her business relationship with the company. What if You Use Microsoft’s Products? Opting out from arbitration with Microsoft, however, is next to impossible if you still use Windows and Office. Although Windows’s EULA, which too bears a binding arbitration provision now, is separate from the agreement for online services, Windows 10 bundles difficult-to-remove apps and operating system functionality (for example, the Windows Store, OneDrive, Skype, innocuous Weather apps, and integration with Microsoft accounts for device encryption key escrow and logins…) — all of which trigger the Microsoft Services Agreement. In a few days, Microsoft is updating that agreement — with a whole bunch of changes that are mostly innocuous, with limited effect on their own. A few seem to hint at limited liability subsidiary shenanigans with foreign customers. Aside: Under a strict interpretation, after buying a legitimate license for $70–85 per year instead of pirating the software, could you even use Word to type up website terms & conditions for your friend’s business? Or use PowerPoint to pitch a startup idea to investors? Or send an email about work from your Office 365 Personal–enhanced Outlook.com account? 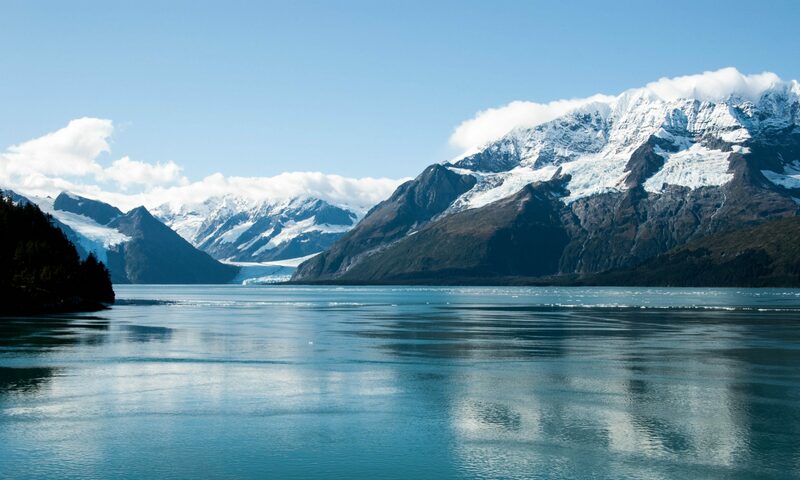 For customers living in the United States, in the Binding Arbitration and Class Action Waiver section, we’ve clarified that disputes to be arbitrated include those about advertising, marketing, communications, your purchase transaction, or billing. We’ve also summarized AAA Consumer Arbitration Rule R-14(a) that allows arbitrators to rule on their jurisdiction and other preliminary matters, and clarified that courts enforce your and our agreement to bring only individual arbitrations. Because the terms in place since 2012 were already so company-friendly, these latest changes don’t incrementally skew them much more, even though they signal the company’s intent to gain all the procedural advantages they can from arbitration. 2. The second change is more interesting. This line is creative, and entirely to the benefit of the company, as I’ll address below. Imagine that you’re a consumer who wants to contest the whole binding arbitration provision as a matter of law. Perhaps you want to argue this: If the agreement to arbitrate was itself invalid (e.g., because a website changed its terms without notice to you and thus you had no ability to reject it by opting out or discontinuing your use of the website), then you have the right to resolve a future dispute as a class action in a real court. Years ago, in the employment discrimination context, the Supreme Court (by a divided 5–4 vote) ruled that even a contested binding arbitration agreement could enable private arbitrators — whose own power to hear the case and thereby receive fees was at stake — to decide the issue instead of judges. Indeed, the practical consequence was that a clause like “We agree to arbitrate arbitrability,” within the disputed contract, could cut out state and federal courts entirely — other than enforcing the arbitrators’ decision! There is reason to suspect that arbitrators deciding the issue of whether they get to hear a case, and thereby receive fees from it, will be systematically skewed toward forcing individuals to use arbitration. Interestingly, not all companies that force arbitration for general dispute resolution use this mechanism. Many choose instead to let federal courts decide the issue of arbitrability. Courts can set binding precedent; arbitrators, who are without judicial power, cannot. By letting courts establish precedent that a particular clause in a company’s contract does prevent class action suits from getting off the ground, the company is able to give that clause more strength — against new plaintiffs who come later. Of course, this comes at a risk: those same courts might rule against the company, establishing adverse precedent and opening the floodgates of litigation. And enabling judges to decide the issue of arbitrability means that, when facing suits by individuals, the company has to fight motions in court, at higher cost and under certain plaintiff-skewed rules. Microsoft’s latest revision tries to have it both ways. By ensuring that courts will decide the issue of compelling arbitration in class actions, but clarifying that individual arbitrators still get to decide arbitrability, the company ensures that 1) class actions get kicked out of court, because the federal courts have to abide by the waiver and agreement to arbitrate; and 2) when an individual brings a suit for herself only, she never gets to step foot in a federal court. I don’t suppose the next annual report is going to disclose two billion dollars in class action costs and lawyers’ fees? Frankly, these moves are in step with the industry — but that’s because everyone in the industry, post-Concepcion, is taking it too far. They are all making it impractical for consumers to assert their rights effectively. If this worries you, contact me — I’d love to work with others in resisting the creep of clickwrap agreements and in the restoration of judicial/jury resolution of civil disputes. Last year, I opted into a class action settlement in Guarisma v. Microsoft Corp., No. 1:15-CV-24326-CMA (S.D. Fla.), as a purchaser of a Surface Book at a physical Microsoft Store, where printed receipts disclosed too much credit card information in direct contravention of a federal law. It’s still impractical for physical stores to impose terms and conditions on walk-in customers, but I bet it won’t be long before the slip you sign for a purchase includes a requirement to submit to arbitration — an unfair practice which, under the Conception holding, cannot be banned by state consumer protection law. See my Disclosures for disclaimers that apply to this post. 2. ↑ AT&T Mobility LLC v. Concepcion, 563 U.S. 333 (2011). 3. ↑ Federal Arbitration Act, ch. 213, 43 Stat. 883 (1925) (codified as amended at 9 U.S.C. §§ 1–16). 4. ↑ See, e.g., Michael Bobelian, Microsoft Takes Advantage of Supreme Court’s Limitations of Class Actions, Forbes (Sept. 10, 2012, 12:50 PM), https://www.forbes.com/sites/michaelbobelian/2012/09/10/microsoft-takes-advantage-of-supreme-courts-limitations-of-class-actions/ (“All a company has to do is make simple changes to the text used in its consumer contracts to shield itself from a class action lawsuit. Microsoft is among those companies amending its agreements to take advantage of AT&T. Recently, it made changes to the Services Agreement governing Hotmail, SkyDrive, Bing, Windows Live Messenger and other online services.”). 5. ↑ Not all binding arbitration agreements are this unfriendly. See, e.g., Alan Henry, Why You Should Opt Out of Forced Arbitration Whenever Possible, Lifehacker (Mar. 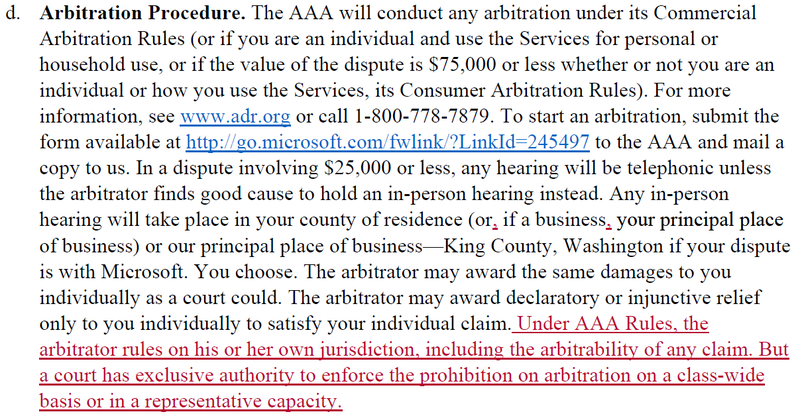 7, 2014, 9:30 AM), https://lifehacker.com/why-you-should-opt-out-of-forced-arbitration-whenever-p-1538184105 (discussing the time-limited possibility of opting out from some of these provisions). 6. ↑ The EULA for Windows requires binding arbitration whether the operating system is separately purchased or preinstalled on a consumer machine. See Microsoft Software Licensing Terms: Windows Operating System, Microsoft Corp. (July 2017), https://www.microsoft.com/en-us/Useterms/Retail/Windows/10/UseTerms_Retail_Windows_10_English.htm (retail editions); Microsoft Software Licensing Terms: Windows Operating System, Microsoft Corp. (July 2017), https://www.microsoft.com/en-us/Useterms/OEM/Windows/10/UseTerms_OEM_Windows_10_English.htm (OEM editions). Enterprise licenses differ. 7. ↑ See Microsoft Services Agreement, Microsoft Corp. (Sept. 15, 2016), https://www.microsoft.com/en-us/servicesagreement/ [https://perma.cc/9X6S-JD9U] (listing “Covered Services,” including the Windows Store, OneDrive, Skype, Microsoft account, Microsoft-made apps bundled with Windows 10 such as Maps and Weather, and the operating system feature Cortana). 8. ↑ Summary of Changes to Microsoft Services Agreement, Microsoft Corp., https://www.microsoft.com/en-us/servicesagreement/upcoming-updates.aspx. 9. ↑ Microsoft Services Agreement, supra note 7; see also Microsoft Services Agreement, Microsoft Corp. (May 1, 2018), https://www.microsoft.com/en-us/servicesagreement/upcoming.aspx [https://perma.cc/7EVX-V5CW] (retaining identical verbiage). 10. ↑ Ever wondered why companies don’t arbitrate intellectual property disputes? Could it be that federal courts are actually more fair than arbitrators? Or that when it’s fighting off patent trolls, the company wants to set precedent? Or is it just that Microsoft wants to pursue the harshest possible punishments when it’s on the plaintiff’s side — results that arbitrators can’t give? 11. ↑ Rent-A-Center, West, Inc. v. Jackson, 561 U.S. 63 (2010). 12. ↑ I want to be clear here that I am referring only to formal “stare decisis”–type precedent, in the domestic civil ADR context. 13. ↑ Unless she surrenders to limited discovery, a cap on damages, in small claims court. In some states, individuals can’t even be represented by a lawyer in small claims court, see Small Claims Court FAQ, Nolo, https://www.nolo.com/legal-encyclopedia/small-claims-court-faq.html; meanwhile, the corporation — a noncorporeal entity — necessarily acts through its agents, i.e., lawyers.